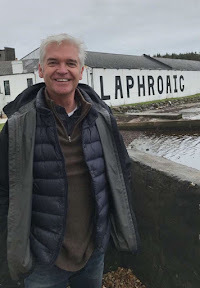 PHILLIP Schofield got his hands dirty on a trip to Islay after cutting the peat made to make the famous Laphroaig Whisky. The telly presenter was in the isle of Islay as he continues his tour of Scotland during some time off from This Morning. He said he was delighted with his trip on the ferry after comparing it to a cruise ship and was extra thrilled when some fans scrawled a welcome note on the dirty rear end of a lorry as he left the boat. 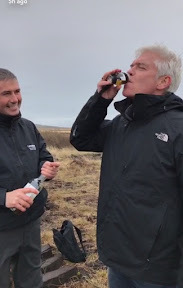 Phil, who posed with some thrilled fans along the way was keen to try out the famous peat smoked malt as he arrived at the distillery, and after a quick tour inside where he met the staff he ventured outside to do some dirty work. He was rewarded with a sample of the hard stuff before heading on his way to Oban. And he admitted he had so much to drink he had to be driven rather than take the wheel on his road trip. The presenter was spotted earlier this week in Balloch park by local people and tourists as he and his wife, Steph, enjoyed a visit up north. 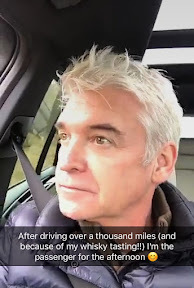 Schofield, who was also spotted in the Lake District earlier this week, is on a break from the ITV show as Eamonn Holmes and Ruth Langsford provide cover.